From aspirin and ibuprofen to antihistamines and cortisone, anti-inflammatory drugs are now the top-selling pharmaceuticals in the world. But daily use of these powerful drugs comes with a price: side effects, many of which can lead to other chronic conditions and the further use of medications. 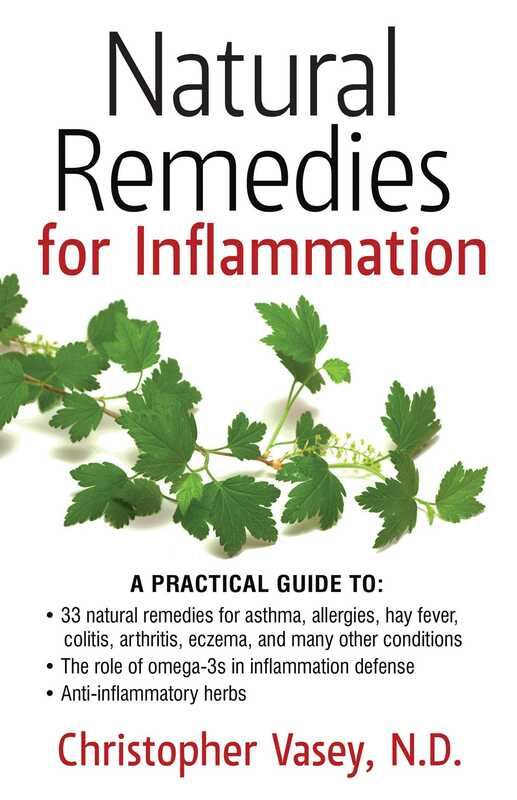 In this practical guide to natural remedies for inflammation, naturopath Christopher Vasey explores 18 anti-inflammatory herbs, such as bay laurel, basil, turmeric, and devil’s claw, as well as 15 other natural substances, such as propolis and fish oil. He explains which conditions each addresses most effectively, proper dosage, and the best methods of ingestion. Vasey explains how, like fever, inflammation is a defensive reaction of the body and also carries out a cleansing process, which natural remedies support but pharmaceuticals can destabilize by contributing more toxins to the internal terrain. He examines 50 of the most common inflammation-related ailments--such as allergies, asthma, conjunctivitis, bronchitis, sinusitis, cystitis, tendinitis, arthritis, eczema, and sciatica--and explains which medicinal plant or food supplement is best suited to safely alleviate unpleasant symptoms while helping the body complete the healing the inflammation was initiated to perform. Revealing the important role of omega-3s in defending the body against inflammation and reducing the damage caused by chronic inflammation, Vasey explores what foods are rich in these key molecules, how much must be eaten to defend the body, and what omega-3 supplements are most suited to your body’s needs. The author also examines how to deacidify the body, as acids have an inflammatory effect, as well as how to use hydrotherapy to calm inflammation. Anti-inflammatory substances are remedies capable of reducing and even removing the reactions of inflammation. To understand how they work, it is necessary to briefly examine the biochemistry of inflammation and take particular notice of a fundamental troubleshooter of this defense process: prostaglandins. As soon as a cell comes under attack it releases two kinds of prostaglandins: antagonistic and beneficial. As their name indicates, antagonistic prostaglandins prepare and trigger the body’s defensive reaction. The blood capillaries of the area under attack dilate and their permeability is increased, which allows greater quantities of blood serum to travel into the tissues to form an edema. They also encourage the transmission of pain signals that inform the body’s defenses of the attack. Any battle will cause damage, however. A brake must be applied to the attack-and-destroy process that the body has implemented. This responsibility falls on the beneficial prostaglandins, which contract the capillaries and reduce their permeability, shrinking the edema. They also limit the transmission of pain signals. The typical reactions of peacetime--construction and repair--can now take place. The first method involves the help of anti-inflammatory remedies. In natural medicine, these include plants; in allopathic medicine, it involves the use of aspirin and cortisone. These remedies block the production of antagonistic prostaglandins thanks to various substances they contain. The body’s defense reactions are thwarted. The production of white blood cells is restrained if not halted outright. The vasoconstriction of the capillaries and the reduction of the edema hamper their passage toward the cells. The inflammatory reaction grinds to a halt. It should be noted though that instead of the normal way this objective is achieved--thanks to the action of beneficial prostaglandins produced by the body--it has been caused by an external supply of blocker substances. The second measure--increasing the production of beneficial prostaglandins--does not rely on medicines but on nutrition. It consists of supplying, in sufficient quantities, the essential nutrients for the production of beneficial prostaglandins, to wit, omega-3s. The importance of omega-3s is the result of relatively recent discoveries. During the second half of the twentieth century, extensive research was performed on essential fatty acids. Among the many properties of the various “F” vitamins--now called omega-3, -6, and so on--are the anti-inflammatory effects of omega-3s. Prostaglandins, whether antagonistic or beneficial, are constructed by the body out of essential fatty acids. The term essential underscores the fact that these fatty acids must be supplied by diet; the body is incapable of synthesizing them itself from other substances. One of the essential fatty acids necessary for the production of beneficial prostaglandins is linolenic acid, also known as omega-3. When there is enough omega-3 supplied by foods, the body easily produces the beneficial prostaglandins it needs to control inflammation on its own. The situation changes completely when omega-3s are not supplied to the body in sufficient quantity. This deficient state is quite common at present because the foods containing omega-3s are rarely eaten. The deficiency in omega-3s is of even greater concern as the production of antagonistic prostaglandins depends on other essential fatty acids that, in contrast, are abundant in the modern diet and consequently the conditions for their production are quite favorable. This accentuates the existing imbalance between antagonistic and beneficial prostaglandins. The fatty acids necessary for the production of antagonistic prostaglandins are linoleic acid and arachidonic acid, which are grouped together under the name omega-6. Linoleic acid is abundant in commonly consumed oils like corn, sunflower, and peanut. Arachidonic acid is found in products containing animal fats: meat, cheese, eggs, butter, and so on. The person who regularly eats meat and cheese--a vast majority of the population--is consequently supplying his body with a large number of the substances necessary to produce the prostaglandins that cause inflammation. Because of their substantial presence in the body, defensive reactions will be quick, strong, and lasting. People who are equipped this way are likely to have easily triggered inflammations that take severe forms--sometimes too severe--and are difficult to stop. The lack of omega-3 and beneficial prostaglandins prevents the body from putting up any effective resistance to the inflammatory response. The foods I have mentioned as sources of omega-3 are those that have the richest concentrations of this substance. Omega-3s can be found in many other foods, though in smaller quantities. When added together they can cover the body’s needs. If despite all this, a deficiency exists, it comes from the fact that these foods (oleaginous seeds, legumes, etc.) are not eaten enough and that today’s diet greatly increases the need for omega-3s by the modern human being. The current consumption of meat is around 200 pounds a year per person in the United States. A century ago, it was far less, with per capita consumption reaching an average of ten pounds or less. One aspect of anti-inflammation therapy therefore consists of giving the body the omega-3s it needs to produce beneficial prostaglandins. This requires a change to a healthier diet and the taking of vitamin supplements that are rich in omega-3s.